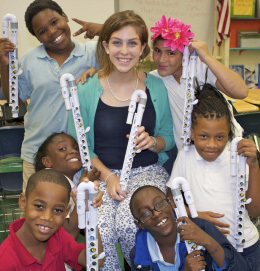 Frost MusicReach is the Community Education and Engagement Program within the Frost School of Music at the University of Miami. The Program is coordinated by Dr. Cassandra Eisenreich who earned a Doctor of Musical Arts degree in flute performance with an emphasis on music education at the Frost School of Music. Cassandra is a dedicated and accomplished performer and educator who has performed at the highest level and inspired students at all levels across the US and beyond. She has an advisory and supporting role as Music Education Specialist with Nuvo. To promote the healthy growth and development of individuals through the study, practice and performance of music. We strive to build healthier communities by investing in the positive development of individuals through music. We strongly believe in developing individuals as musical ambassadors of peace, hope and understanding amongst people of diverse cultures, backgrounds, and beliefs. Frost School of Music students serve as mentors, teachers, and role models in our Frost MusicReach programs and projects. These experiences provide Frost students with the chance to develop and enhance their music teaching and performance skills in authentic situations. These experiences help to better prepare Frost students for a future as successful, aware and socially responsible members of the professional music community. The Frost MusicReach program values the importance of a multi-tier mentoring model. Frost undergraduate students are paired with graduate students to teach classes within each program. These experiences allow graduate students to serve as lead teachers while also guiding and mentoring undergraduate students in their teaching. Additional graduate students from the Frost School serve as supervisors overseeing each program. These experienced graduate students help with curriculum development, implementation and teacher guidance. In our Frost MusicReach programs, we strive to cultivate an environment where students can be themselves, learn, grow, and embrace the life lessons that come along with studying music. Nuvo has provided Frost MusicReach with an opportunity to reach more students by creating high quality instruments at an affordable price. After trying Nuvo instruments for the first time, we were impressed with the initial experience and became interested in researching the instruments in greater detail. Once the research began, we immediately wanted to get involved and find a way to reach more children with these instruments. Frost MusicReach has implemented the Nuvo jFlute and Clarinéo in our Frederick Douglass Elementary School program where our afterschool group lessons run twice a week for 30 minutes. Many music programs use recorders as introductory instruments. The recorder is great to help students learn the basics of music, however, the air needed to play the recorder is not in any way representative of the air needed to play wind instruments in general. It is clear that Nuvo instruments are bridging this gap and allowing students to begin playing these instruments comfortably at a young age. small group classes. The transition from Nuvo instruments to their full size equivalents has been seamless, without any major issues with maintenance or repairs. Our students are grateful to have instruments to call their own and we are happy to provide them with Nuvo instruments (see them in action)! Check out our First Steps Book! Check out the new article about Nuvo Instruments!